Circadian rhythm sleep disorder can happen when there will be a disruption in a person’s normal circadian rhythm. 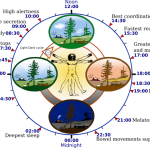 Circadian rhythm is the term referred to a person’s “internal body clock”, which is responsible for the regulation of a person’s 24 hour cycle of biological process inside the body. Circadian comes from the Latin word “circa” and “diem” meaning “around the day. The circadian system is responsible for certain brainwave activities, production of some hormones, regeneration of cells, and other biological processes that are associated with the 24 hour cycle. 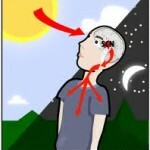 Circadian Rhythm Sleep Disorder: Where is the Circadian System Located? 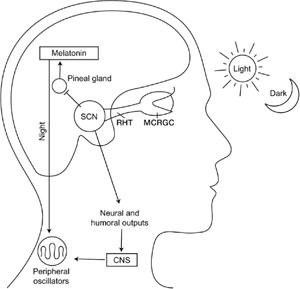 In humans, the circadian system is located in the brain, in the hypothalamus. 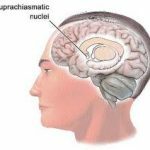 In the hypothalamus, there is a group of cells where the circadian system is specifically located, the Supraschiasmatic Nucleus (SCN). The circadian system plays a major role in determining and regulating the normal sleep-wake patterns in human beings. Since the circadian rhythm is associated with different biological processes that help in regulating the 24 hour cycle in human beings, there can be a lot of different changes and factors that can disrupt the normal biological processes in its system. Here are some of the common and usual causes of the normal processes, which can cause circadian rhythm sleep disorder. Extrinsic Circadian Rhythm Sleep Disorder– This type of circadian rhythm disorder comes from the Latin word “extrinsecus”, meaning from the outside. The extrinsic type of circadian rhythm sleep disorder is circumstantial. Jet Lag (Rapid Time Zone Change Syndrome) – this type of syndrome is caused by a person who travels across different time zones. 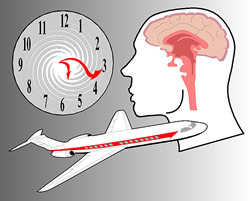 Jet lag may be characterized by fatigue, excessive drowsiness and poor daytime alertness. Shift Work Sleep Disorder– this type of extrinsic circadian rhythm sleep disorder is common in people working night shifts and/or rotating shifts, such as medical professionals, security guards, policemen, etc. Intrinsic Circadian Rhythm Sleep Disorder – This type of circadian rhythm sleep disorder comes from the Latin word “intrinsecus”, meaning from the inside. The intrinsic type of circadian rhythm sleep disorder is built-in in the body. Delayed Sleep Phase Disorder (DSPD) or Delayed Sleep Phase Syndrome (DSPS) is a type of circadian rhythm sleep disorder characterized by a delay in the normal onset of sleep and offset of sleep. 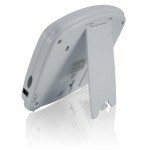 And in DSPD, there would be a peak in alertness usually during late at night. 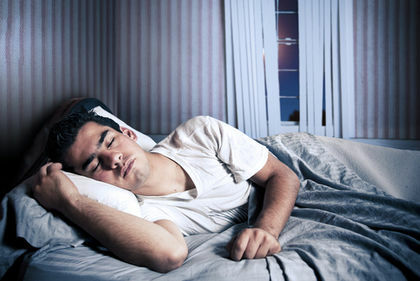 Advances Sleep Phase Syndrome (ASPS) is a type of circadian rhythm sleep disorder characterized by difficulty staying awake at night and difficulty staying asleep in the morning. Non 24-Hour Sleep-Wake Syndrome is a type of circadian rhythm sleep disorder characterized by an inconsistent sleep cycle. People suffering from this sleep disorder suffer from inconsistent insomnia which can happen at different times every single night. In this type of intrinsic circadian rhythm sleep disorder, a person may either sleep very early and wake up very early the next morning, or sleep very late at night and wake up very late the next day.